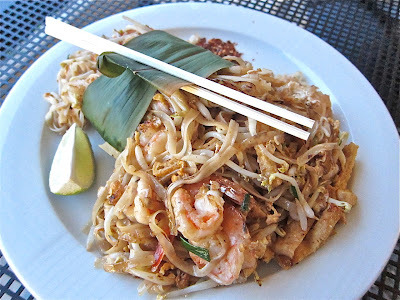 I've said it before and I'll say it again: I ultimately judge Thai restaurants by their Pad Thai. When done right, it's one of my favorite dishes, but it requires the balancing of a lot of flavors. I've had plenty of bad ones and very few good ones. 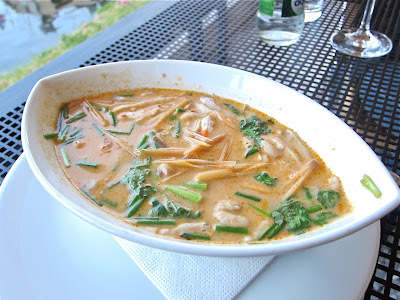 My standard for excellent Pad Thai in Prague is the one served at Noi. In fact, it's among the best I've ever had. There's a lot going on in that dish. 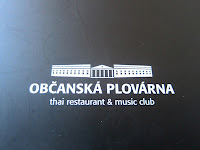 I read a report that there was a really good one being served at the Thai restaurant, Občanská plovárna. I went to check it out. The restaurant sits on the river below the main embankment road. The nearest tram stop is Čechův most. Trams 1, 8, 12, and 17 go there. I used come to this building in the late 90s when it was a high-end restaurant called Aqua. The 2002 floods wiped out the structure's interior. It's had a series of tenants afterward that didn't interest me. But it's a great location. They've done up the interior with some Thai touches. There are great glass window walls that completely open up the dining room to the river. 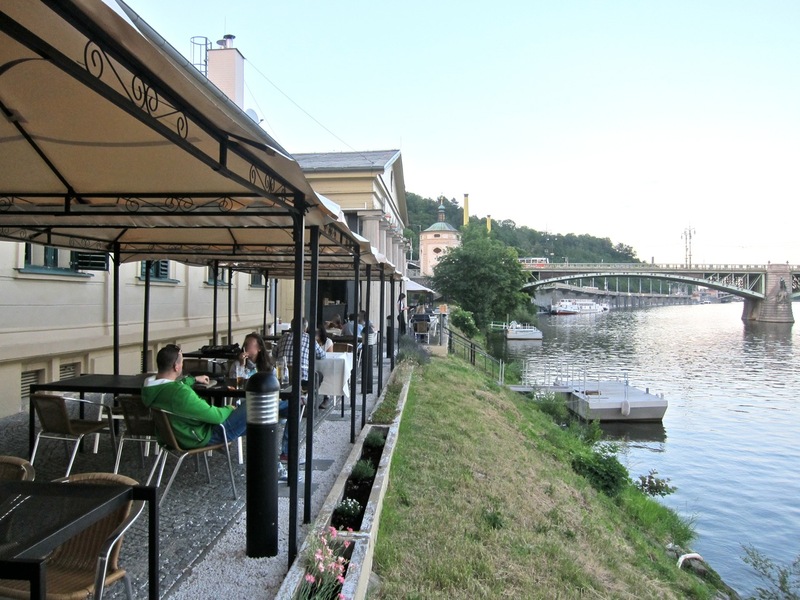 Outside there are plenty of metal tables along the banks of the Vltava. Some had table cloths, which lent a more upscale feeling. It was less pleasant to eat on bare black metal. Either way, there is a good view. The tables also have good cover in case of rain. On my first visit, I had the Pad Thai. But I'm going to save my review of that for the end. I started off with a beer. They serve Lobkowicz, which I quite like, in .3 liter glasses only (30 CZK). It's a nice alternative to Pilsner Urquell. I do wish they had half-liter glasses. 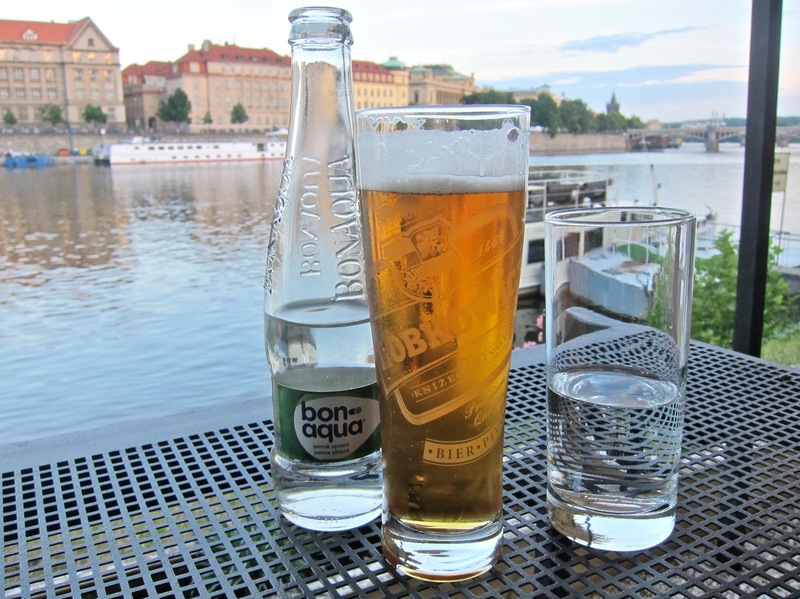 They also serve BonAqua sparkling water (45 CZK), which I really don't like. First, the price is crazy. Second, the .25 liter bottles are too small to quench your water needs through a meal. And third, Mattoni is Czech, tastes better, and comes in more satisfying .33 liter bottle. My date had a .2 liter glass of wine (50 CZK). It was fine. We both ordered soups. They took a long time to arrive. I had the Tom Kha Kai (95 CZK), another classic Thai dish. It was lightly sweet with the comforting aroma of galangal. The chicken was fresh and not overcooked, as is sometimes the case. 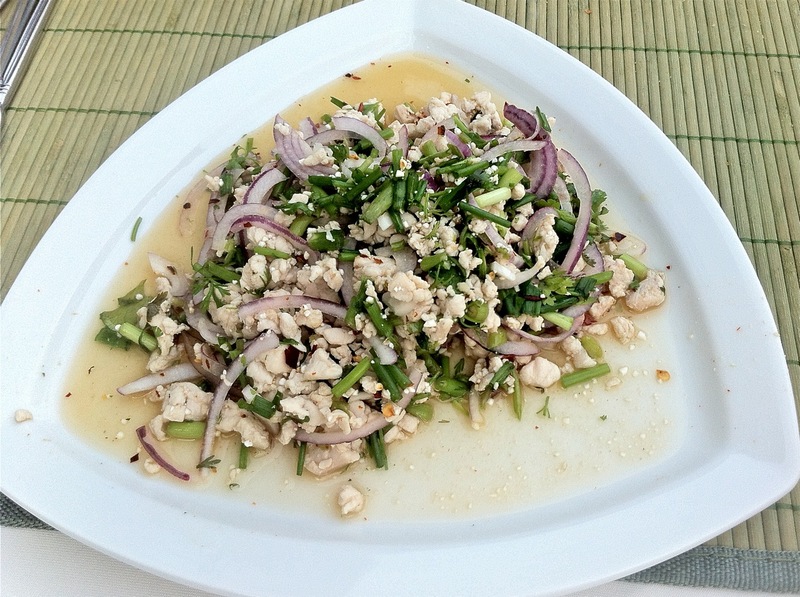 There was also a good balance of lemongrass, fish sauce, and cilantro (coriander). The bowl was large. My Italian companion had the Tom Yum Kung (105 CZK). This roughly translates as hot and sour soup with shrimp. Indeed, I usually enjoy this soup at other restaurants because of its terrific tang. Here, the broth was more salty than sour. The chef at this restaurant is Thai, but I've never had a version quite like this. Dull, almost raw mushrooms floated at the top. Underneath, there were three, delicate, properly cooked shrimp. This was a similarly large serving of soup. I didn't like it much. This meal, which included the Pad Thai with shrimp (285 CZK), some stir-fried spinach, and a long wait for both came to 815 CZK. I returned on a warm evening with G-Man. 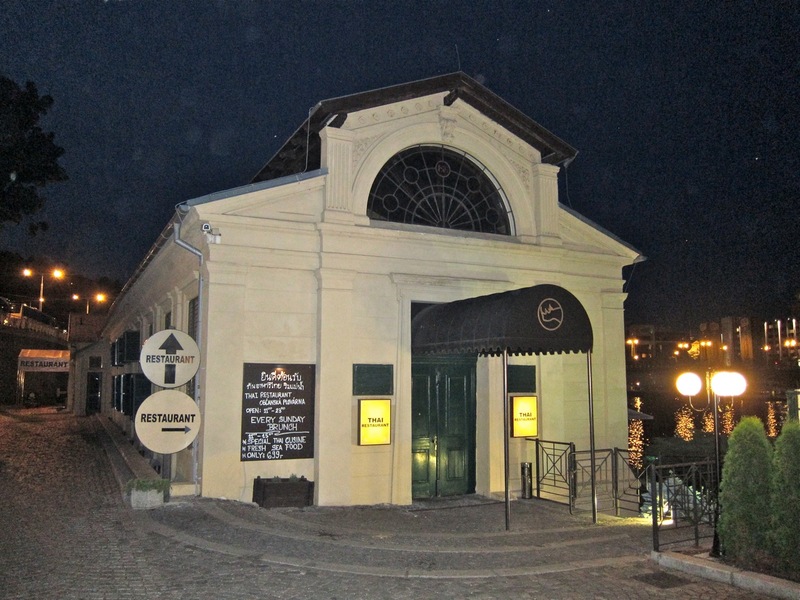 He started with the fried black tiger prawns (175 CZK). You get six medium-size crustaceans with plenty of bread crumbs on them. There was the standard sweet chili sauce on the side. They were nice and crunchy, but it's not something I would have ordered to test the skills of the kitchen. 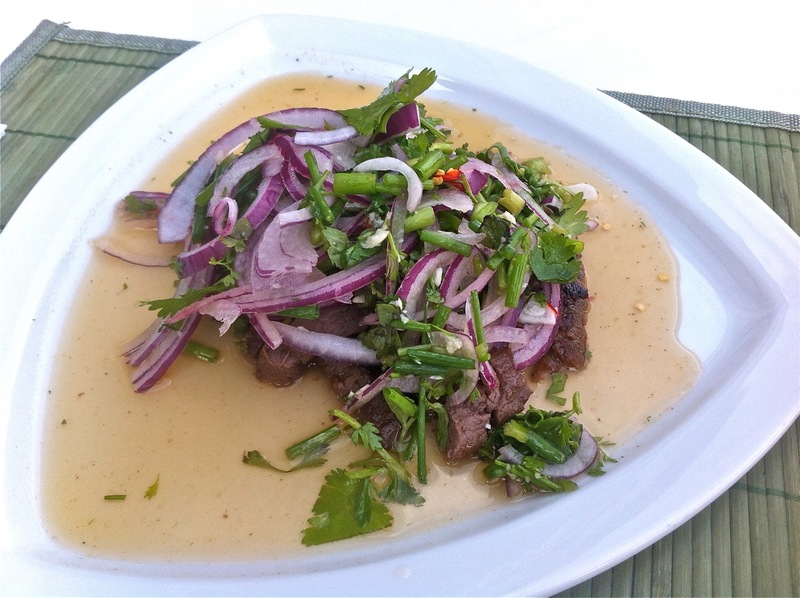 I had the Pra Neua or which the menu describes as marinated beef tenderloin with lemon grass, cilantro, and Thai herbs (185 CZK). This I loved. The slices of beef were incredibly tender and tasty. All too often when I get beef salads in Prague, the beef is all too tough. Not here. The dressing had the perfect balance of fish sauce, lime juice and, coriander, and mild, sweet onion. It was the right mix of sweet, savory, and sour. The portion was not large, but the quality level was high. Inspired by my choice, G-Man ordered the Lab Kai (165 CZK). This is billed as a salad with fresh coriander, mint, onion, lime, and chicken. It basically tasted the same as my dish, except with chicken. 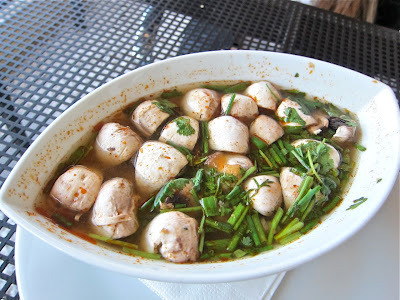 I didn't really detect the mint in there, and it was not as spicy as my Pra Neua. We both liked it anyway. 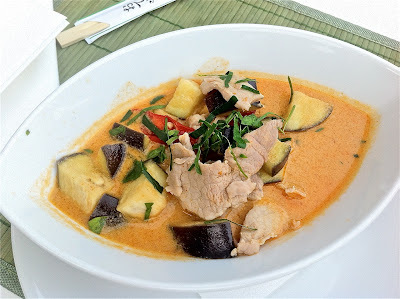 Then I got an order of panang curry with pork (185 CZK). Rice was included with this dish. The mildly sweet sauce had the strong flavor of lime leaf I like. It also was thin and soup-like. I long for thicker curry sauces in this town. The pork was fresh and not overcooked. Other than that, there was really only lightly cooked, chewy eggplant chunks. Not too exciting. This meal, which included five beers and two glasses of wine came to 960 CZK. The service was a bit better this time. And what about that Pad Thai with shrimp? First, it was certainly the nicest presentation I've seen. The huge portion came wrapped in a banana leaf. It's really enough for two people. I took half of it home. There was a generous portion of butterflied, properly cooked shrimp. The tofu picked up a smoky flavor from the grill. And yet the massive amount of rice noodles themselves were unforgivably bland. I squeezed out the one lime wedge, but it didn't help much. I'd probably need at least two or three more to get the flavor right. And though there were chili flakes on the side, the crushed peanuts were missing. As in not there. In addition to more lime, I'd wish for another dash of fish sauce and a hint of sweetness. And I wouldn't forget the nuts. These are my tastes, but my date agreed with me completely. This Pad Thai didn't make the grade for either of us. While I loved the beef and chicken salads, the noodles and curry left me disappointed. 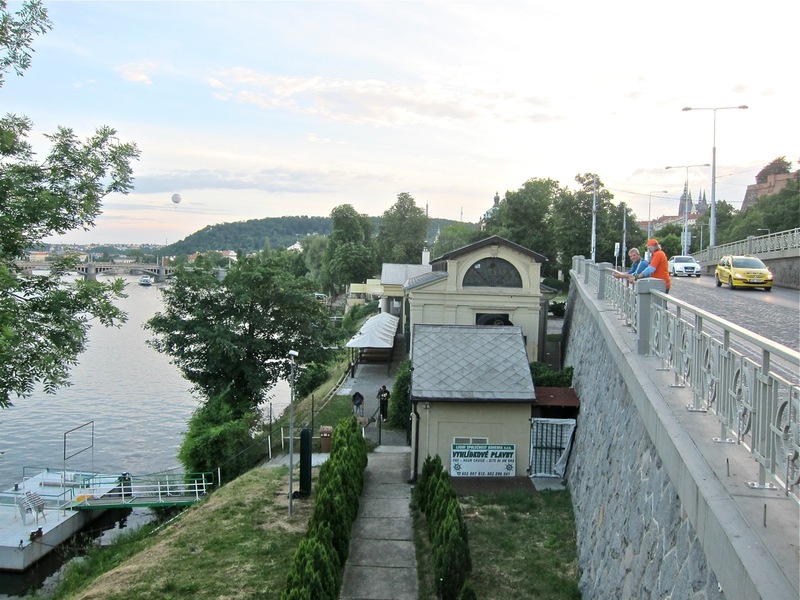 The view and the peaceful location are perhaps the biggest draws for Občanská plovárna. The trams that go there are not the most convenient for me, but a better option for some, including me, is that they have their own parking lot. It's something I'd consider on a nice weekend day. But given my standards, I'll probably still choose Noi when I'm in the mood for Thai. I enjoyed reading your blog post. It has been a few weeks now since I visited a Bohemian, a local one. I went recently to Občanská plovárna as well. Food was okay, but some dishes just missed. Not enough herbs or subtle flavoring. Spicy food was HOT and not much more. 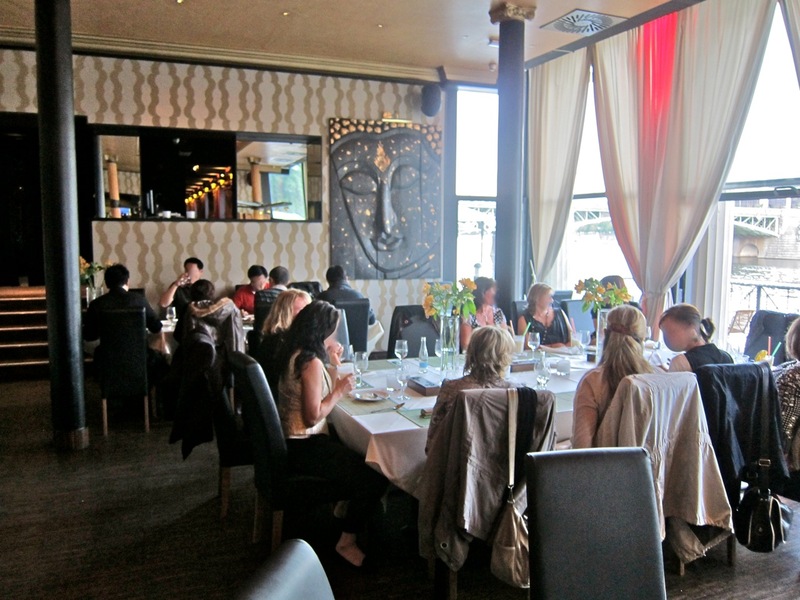 Staff was completely untrained and knew NOTHING about Thai food, which was a shame. Also slightly off-putting were the stag groups and strippers wandering on and off the terrace to boats waiting at the dock below.